The term “ a person of interest” applies to this man who was born in Chester County Pennsylvania in 1763 and led a very active and exciting life. His connection to Letchworth is the same as that of Moses VanCampen. He and Van Campen both ran the gauntlet at the Caneadea Council House and survived. A biography of Jones is published in the “History of Livingston County New York” by James H. Smith and Hume H. Cole, as published by D. Mason & Co. in 1881 and from that we find this quote: “ At the age of sixteen he entered the military service of his country as a member of the “Bedford Rangers”, a rifle company which embraced thirty-two young men, the flower and chivalry of Bedford County. This company had gained great renown for their valuable services in repelling the incursions of the hostile Iroquois, who “ hung like the scythe of death upon the frontier settlements inscribing their deeds with the tomahawk and scalping knife in the characters of blood. In the early spring of 1779 the command was most unfortunately drawn into an ambush by a large party of Seneca Indians - and fully a third of the Rangers were killed at the first fire. About a third escaped and the balance were made prisoners. Young Jones would have got away , as he was a very fleet runner, but one of the strings of his moccasins became loosened and wound around a staddle in the underbrush, which caused him to fall and as his rifle had been discharged he had no means of defense and with several of his comrades was taken and securely bound by the savages." Jones was reportedly taken prisoner by a specific individual who was half Indian named Jack Berry whose purpose was to find a replacement for a woman's son who had been killed in battle. This was a common practice at the time as we know from the Mary Jemison history. His capture happened at an area of Pennsylvania near the Juniata River in Huntington County. As early as 1744 a trading post existed near the site known as Hart's Log" because the trader named Hart kept a large hollowed log as a trough for feed and salt for horses. The Hart's Log trading post was located within what is present day Alexandria Pennsylvania and to this day the people there hold a festival of home crafted items and home cooked foods that is known and "Harts Log Day" that has its own website. The prisoners were taken to Nunda and then to Caneadea where they were forced to run the gauntlet at the Council House. It was there that a Seneca named Jack Berry saved his life. When the captives were to run the gauntlet at Caneadea, he advised Jones to run the gauntlet behind the next to last prisoner and to keep close to the line of Indians on one side so that theu had no room to get a clear swing at him with a weapon. Berry managed to conceal Horatio so that he was in the last part of the group of runners which also helped because the Indians were looking at those who had already managed to pass. Jones made the run successfully, and was adopted by the Seneca. The history goes on to state that Jones’s attempts at escape failed and he eventually accepted his situation, learned the language and because of his enthusiasm and physical capability became a favorite among the captors. When Van Campen was captured the second time it was Jones who was instrumental in having him exchanged to the British before the Indians realized who he was. At the end of the war he was appointed by General Washington as agent and interpreter for the Six Nations. One notable achievement was as interpreter at the famous Big Tree Treaty in 1797. Jones served in that capacity for forty years. A site on the web, "My Genealogy Home" had some interesting and varied information about Horatio Jones. We also referred to a "Life of Horatio Jones" bu George Henry Harris that is available at the online library at Cornell University. It is inferred that human relationships entered into the Indian success of Jones. For instance the woman who was his adoptive mother was a sister to chief Cornplanter. That had to carry some weight with his captors. He is credited with outstanding strength and physical agility in his competition with his Indian captors including at the time he ran the gauntlet when captured. Jones was married twice. It also appears that he was married to an Indian woman and had one son that remained with her clan. In 1784 he married Sarah Whitmore who was also a captive. The were married after being set free as a result of the treaty of Fort Stanwix. At this time he was situated at what is now Waterloo and was a fur trader in partnership with John Jacob Astor and dealing with him in New York City was common. Their first son was Col. William W Jones who died in 1870 in Leicester. There were three other sons from that marriage. He married again a after Sarah died. His second wife was Elizabeth Starr with whom he sired 12 children with at least 8 being girls. By 1797 Jones and his family were living on their 3000 acre farm on the banks of the Genesee river in the town of Geneseo. This land was given to him by the Seneca and we assume it was as a reward for his service at the Treaty of Big Tree. At that gathering he is also credited with convincing Robert Morris to convey to Mary Jemison a reservation that turned out to be much larger than the treaty authors expected. Jones died at age 73 in August of 1836 at his farm, known as Sweet Briar, on the banks of the Genesee river in the Town of Geneseo. His life and legacy to the western New York area are worthy of note as part of the rich heritage of the pioneer story and will not be forgotten in the Genesee Valley. Neither will the Caneadea Council House that was an important part of his story. The Council House, dating back into the 1700's, had deteriorated very badly since the time when Horatio Jones and other captives had seen it. This situation was brought to the attention of William Pryor Letchworth by James Shongo who knew of his interest and dedication to preservation of the Native American heritage. 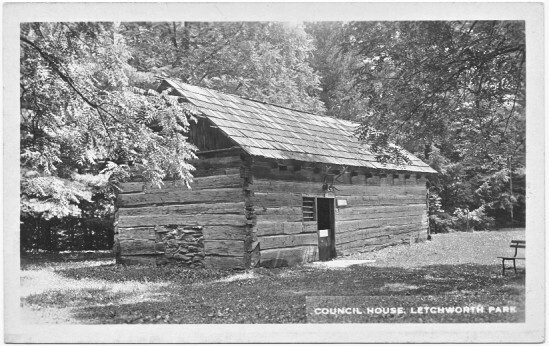 The Council House was acquired by Mr Letchworth and relocated to his Glen Iris estate on 1871 where it and its interesting history has been permanently preserved and restored to the highest standards of historic preservation.